Cicero’s philosophical works introduced Latin audiences to the ideas of the Stoics, Epicureans and other schools and figures of the post-Aristotelian period, thus influencing the transmission of those ideas through later history. While Cicero’s value as documentary evidence for the Hellenistic schools is unquestioned, Cicero: The Philosophy of a Roman Sceptic explores his writings as works of philosophy that do more than simply synthesize the thought of others, but instead offer a unique viewpoint of their own. In this volume Raphael Woolf describes and evaluates Cicero’s philosophical achievements, paying particular attention to his relation to those philosophers he draws upon in his works, his Romanizing of Greek philosophy, and his own sceptical and dialectical outlook. The volume aims, using the best tools of philosophical, philological and historical analysis, to do Cicero justice as a distinctive philosophical voice. Situating Cicero’s work in its historical and political context, this volume provides a detailed analysis of the thought of one of the finest orators and writers of the Roman period. 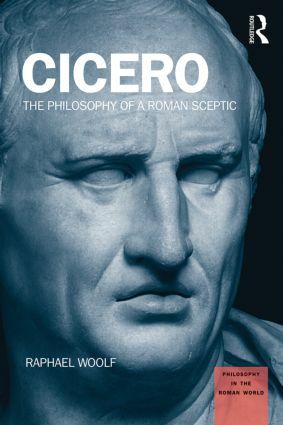 Written in an accessible and engaging style, Cicero: The Philosophy of a Roman Sceptic is a key resource for those interested in Cicero’s role in shaping Classical philosophy. Raphael Woolf is Reader in Philosophy at King's College London. His work focuses on ancient philosophy and he has published on Plato, Aristotle and Hellenistic philosophy.